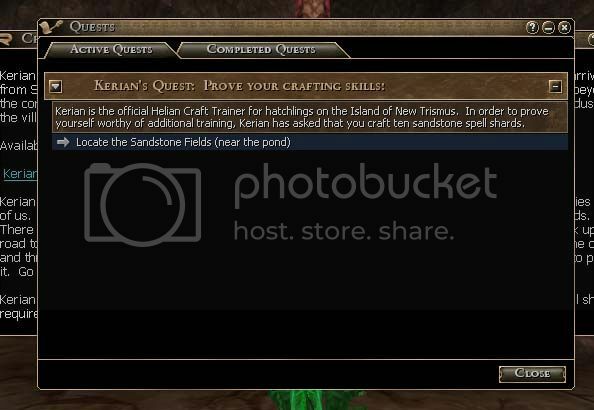 so, kerian has given you a quest to make spell shards. off you go to the sandstone field! 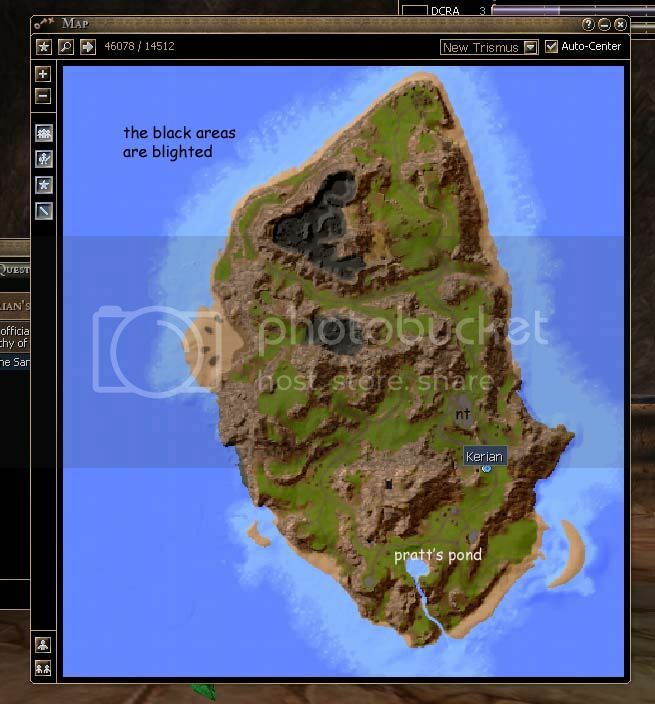 it's a big island, and first timers can get lost quickly and wander into areas they aren't ready for yet. 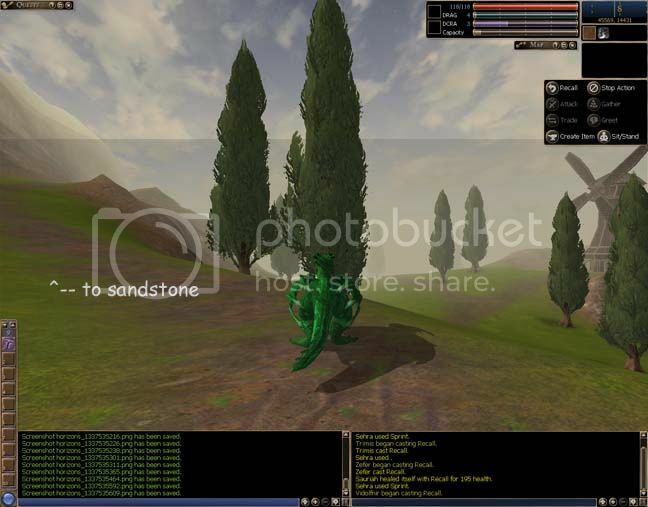 so let me take you on the scenic route to the sandstone field - and show you some things you need to know for future! by now, you should be familiar with the road to town from the caves. once you are at the top of the valley, to your left you will see an unpaved road between the knowledge shrine and the connie/pawnbroker tent. take this road out of town. at the outskirts of town, you will find the port to the greater world on your left. the road continues on in a curve, but you can take a small shortcut down a small hill into the middle of the cedar field if you run to the left of the port pads. continue following the road until you come to a crossroad. up the road to your right is the copper and tin ore field (we will find out more later) and the metal workstation. for now, continue on the road leading left, thru the cedar field. the woods here are safe, but once you reach the wood workstation, you will run into a field full of cedar treants (mostly saplings, as this is the training isle) - my advice, do not tangle with them! 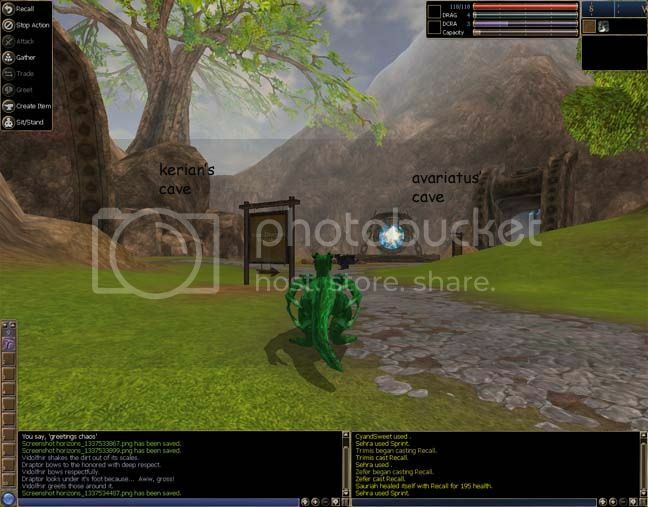 you will get a quest from avariatus that will make you very familiar with them. just past the treant area, the road will fork again. the sandstone field is on the left hand road, but let's take a short sidetrack. the right hand road leads to a windmill. this windmill will play an important part of your gifted quests - inside is the assessor of endurance. 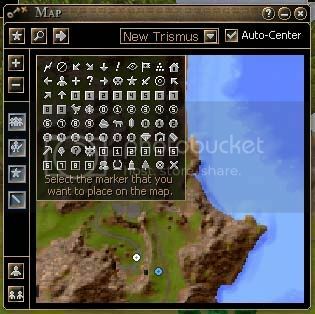 before you start your gifted quests, i suggest you are very familiar with the road between the windmill and new trismus, at least. 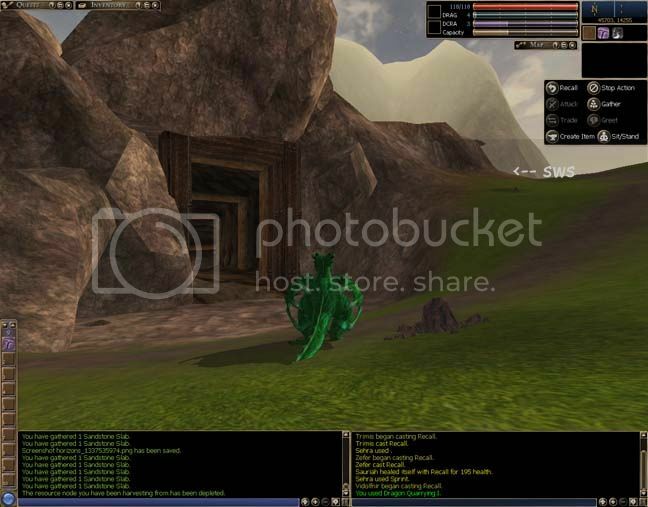 it is very beneficial to be as familiar with the evil place as you can be before starting your gifted quests, as the assessors are scattered all over the island and at least one quest relies on speed to complete. for now, continue on the left road. you will start to see sandstone nodes, but continue on to the greater field. at the point you see the field, look to your left. you will see a cave entrance that is very easy to miss as you run past it, as it is somewhat deep into the hill. this is the gem cave - something else you will need for later quests. you will also see the sandstone and flax field (flax is not something draggys can use, but it is good to know where all resources are!). 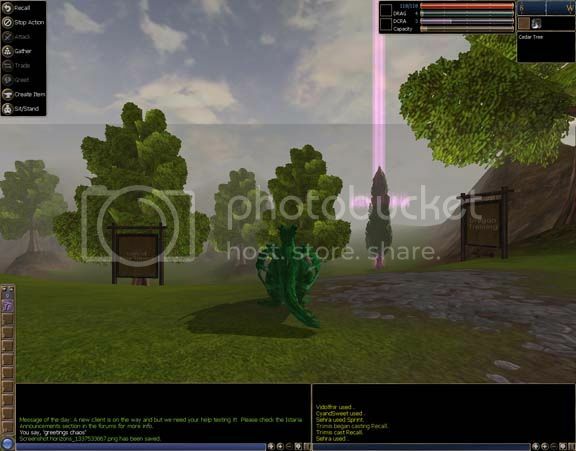 keep running tho, until your quest journal and chat log show you have found the field as kerian instructed. 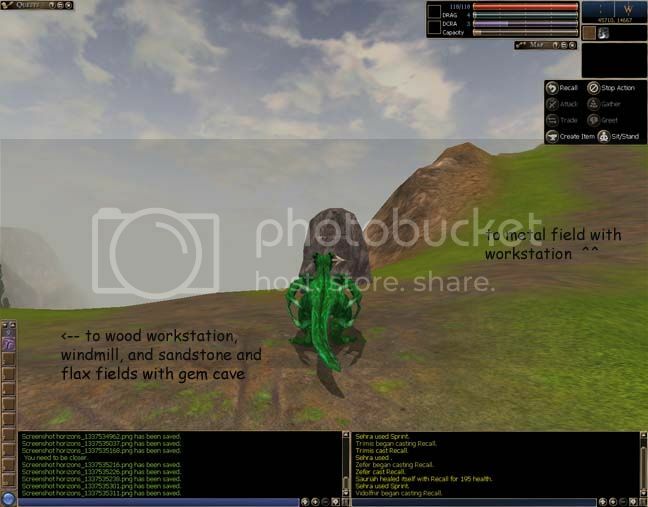 next post, we will make the spell shards and i will show you more of the resource fields and workstations in the area on the way back to kerian. see you then! hey, you made it!!! time to start the neverending grind that is crafting. as you remember, milicent gave you a hint to return to the caves near the port you arrive from skalkaar island. this is easy enough - near the patio with the book of knowledge, you will see 2 signs - one pointing the way back to the dragon training caves. 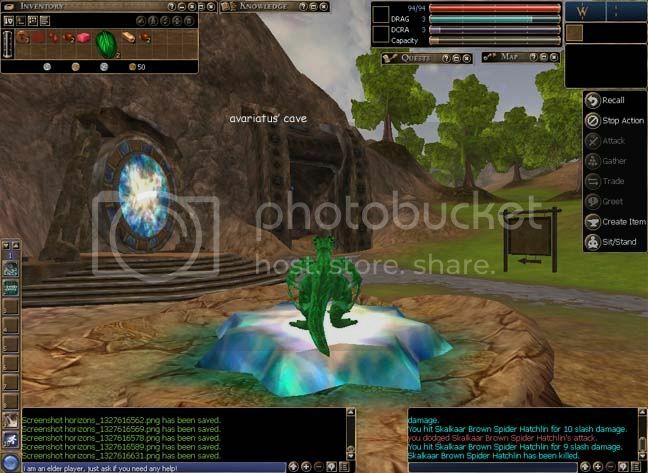 down the road past the deer and at the end of it, you will see the port pads and two caves - on your right is the dragon adventure trainer, avariatus; on your left, the cave of the craft trainer, kerian. okay, now that you have made the noob error you never make twice (except me, so you don't have to do it the once), you crestfallenly exit avariatus' cave and head into kerian's. 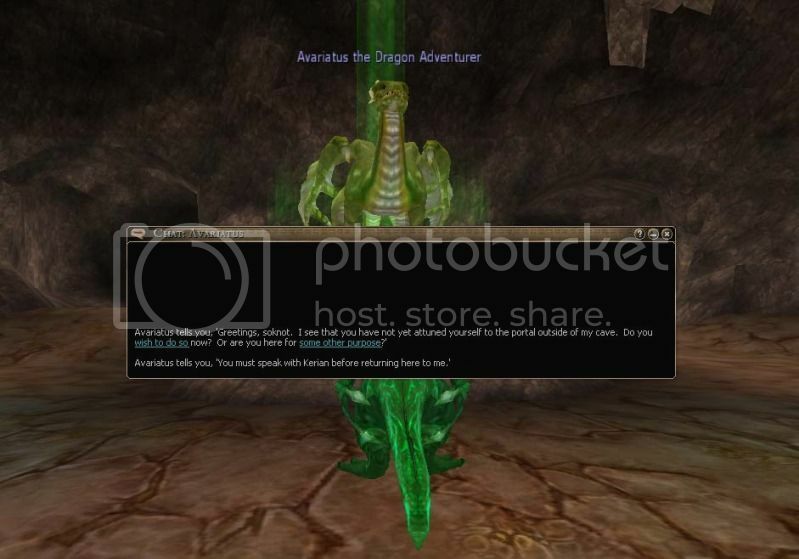 greet the crafter as usual and listen to the speech outlining your first quest. check your quest journal, of course, for specifics. make sure you scribe the spell shard formula. 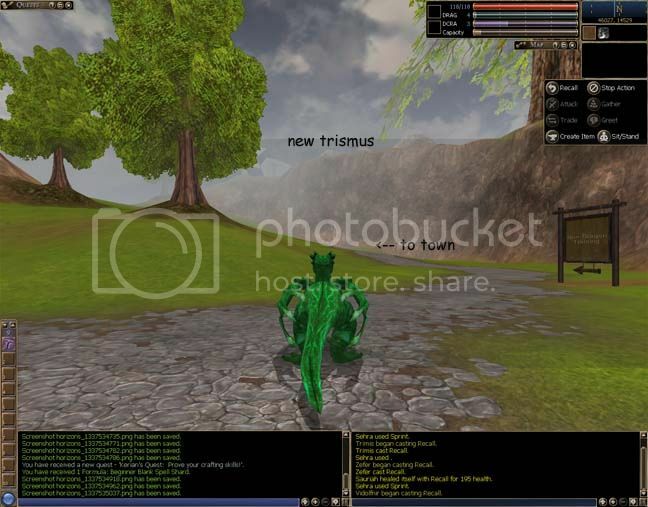 it's a big world, and new trismus is only a small part of it. the island will seem big enough for now, as you will come to think, if you are like me. lots to explore, and i hope you do so, as this blog is just not enough to do true justice. so, join me next time, as we start our true journey! 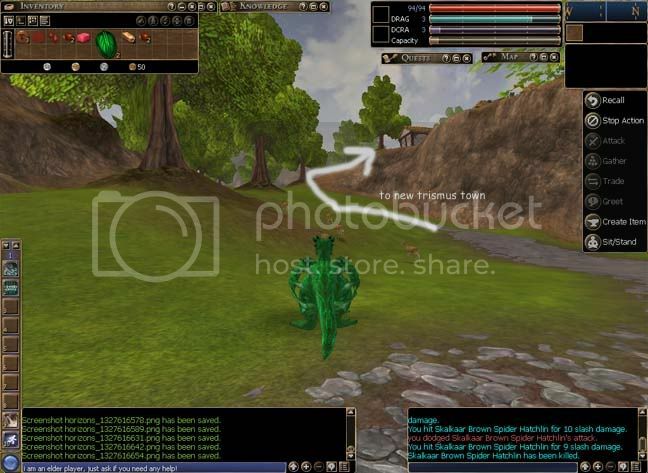 okay - time to explore your first home base to discover the wonderful world of istaria! 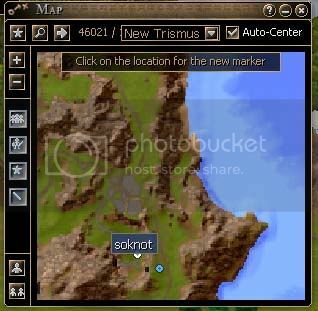 when you pop up on the new trismus from skalkaar island, you are in a valley. on your right and left are caves (which we will talk about later), slightly behind and to the left is the port back to skalkaar island, and in front of you is a paved road leading to the town of new trismus proper. when you come up the road, in front of you in the center of town, you will see the shrine. i recommend you bind to it, as it will become necessary for more than just quests. however, this is not an immediate need - you will get a quest that teaches you about binding, if you are totally new to the game. if you want to bind now, just do the normal select and right click, and choose bind to object. 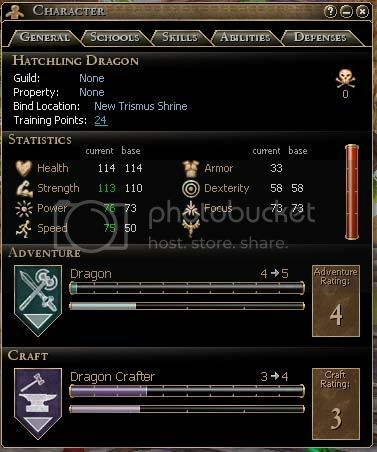 checking your character page will always show you where you are currently bound. 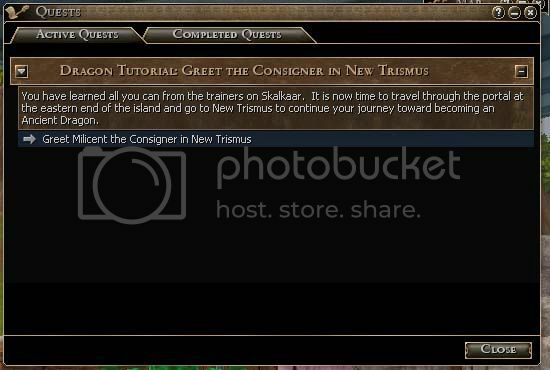 it's been a little while, so you may not remember that you actually have a parting task from karkath to greet the consigner on nt. in the game towns and settlements, consigners and pawn brokers are often found together, making it easier to buy and sell. 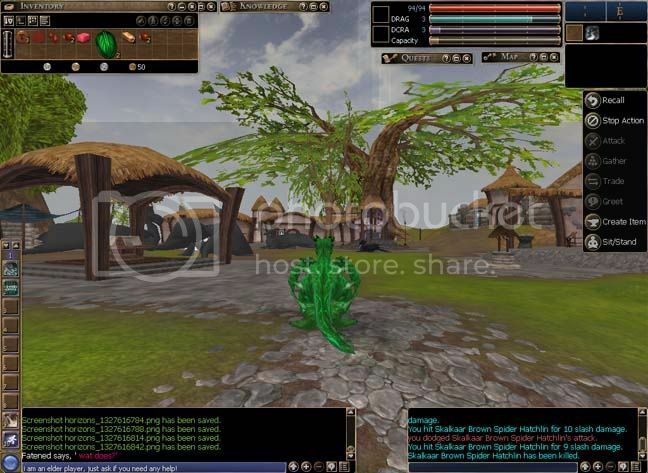 on individual plots, alts can choose one or the other, and they may not be found in close proximity. 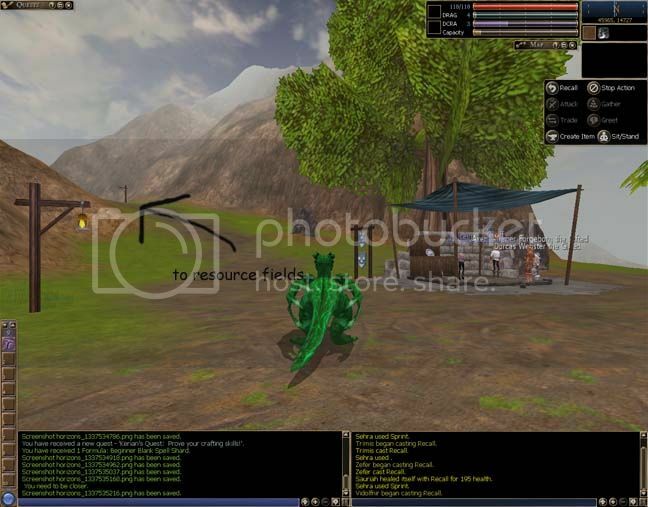 on nt, milicent the consigner and geoff the pawnbroker are found under a tent on your left as you exit the port valley (in the screenie, you can see the tent in the extreme left center, just beyond the large dragons).  when you approach, you will get the tutorial screen - read if you need! - and see milicent and geoff. greet milicent as usual and listen to her speech welcoming you to the big world. she also points you back down the road thru the valley to consult with the dragon trainers in the caves. 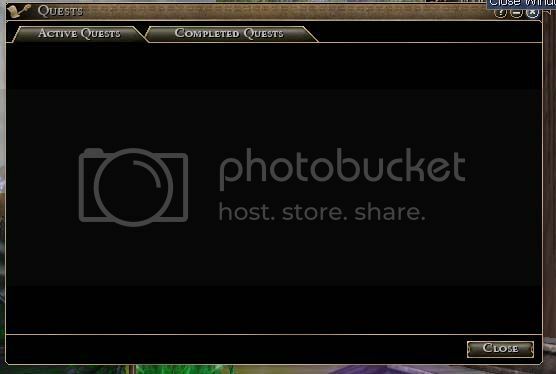 you may notice your active quest journal is now empty. we are about to change that!!!! 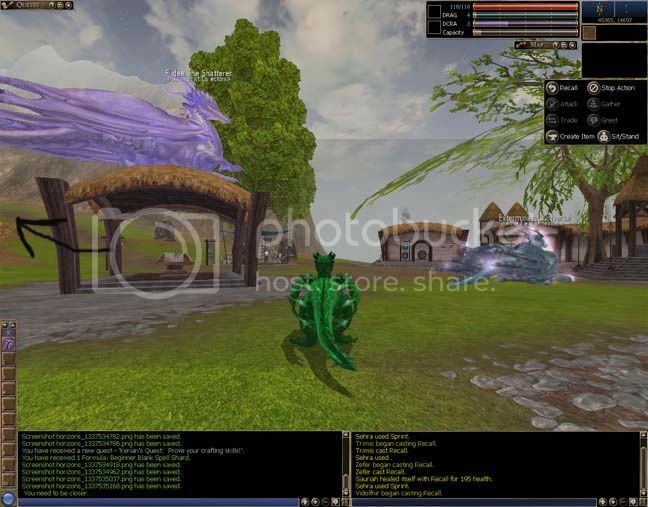 when we come back, you will start your endless journey thru istaria, the best lil mmo in town! see ya soon! congrads!!! 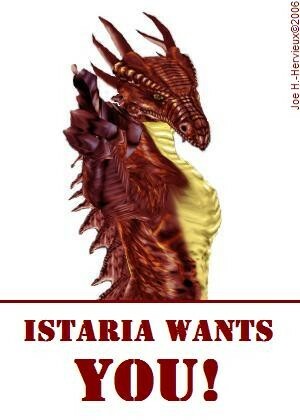 you have completed your tutorials and are ready to enter the real istaria! it is a big and exciting place, as you will soon learn! 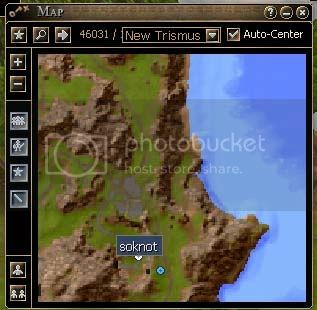 allow me a moment to rant - i just got an awesome new puter, it's super sahweet and all....... but i went home to blight and had vel doing some bright work, cause the industrial complex will never get built if i don't get moving - anyway, i really miss my map markings. i had some pretty hard to find stuff marked that i no longer remember....... therefore, let me take a few moments to show you how to do that, because in my opinion, it's one of the best things about istaria. first, open your map. i believe there is a blue gem option for it, but i do it this way: right click on your compass and choose 'show map' (it is also a good idea to choose 'show position' as well). on the map, white dots are you and your disk, if you have one disconnected and in the map range. blue dots are npcs, and green dots are group members within range. 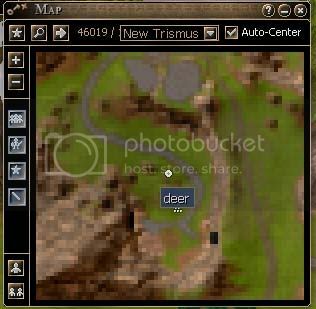 around the left border of the map image, you will see various buttons. the bottommost buttons are for grouping - the single icon is to find your closest group member, the multiple icon is to find the map positions of all group members, starting with the closest. 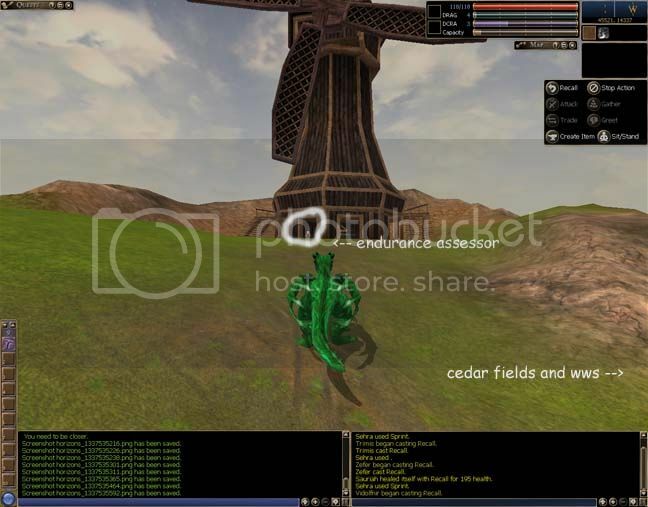 the center buttons are 'centering 'buttons, useful for finding specific creatures, monsters, etc. the +/- buttons are self explanatory, altho i use my scroll wheel to zoom in and out. the buttons we are concerned with are the top ones. 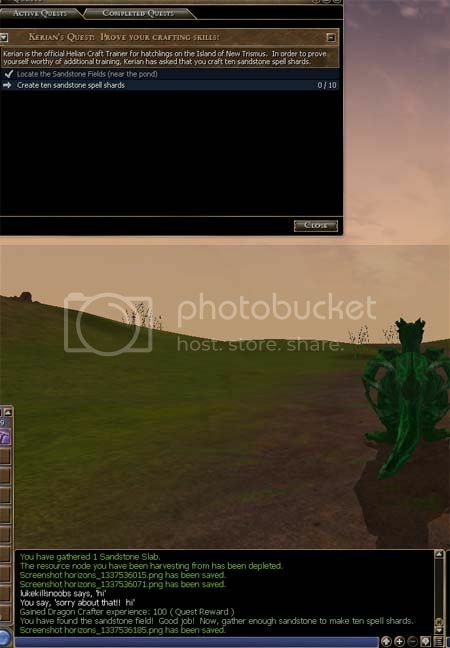 i must be honest and admit that i have never used the arrow button and have no idea what it does (but i plan on getting back onto vel and i will find out! ), the magnifying glass is a search function. we are most concerned with the star button right now. that is the marker menu. click on it. this will open a small screen of icon choices. you are free to use whatever system you like. as an example, i will be marking the herd of deer that roam the valley nearby. for resources, i use the icon that looks like a pile of cannon balls (top row, second from right). the house icon next to it, i use for workstations, the house with the dot in it (near the center right) i use for guards and questgivers, and the almost closed circle in the bottom row is my icon for ports. click the icon you wish to use. 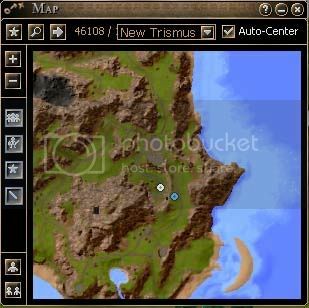 the map will ask you to select where you want the icon to go. i am usually very near to where i want the icon to go, so i can click anywhere around the white dot, but you can put your icon anywhere in map range. 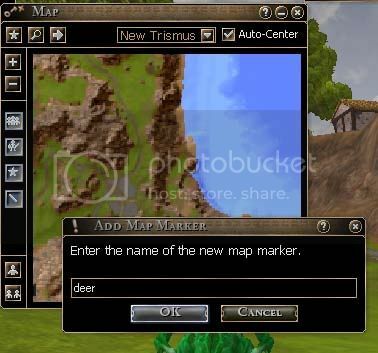 once you have placed the icon, the map provide you the text box to name the marker whatever you desire. and there you go! you have now marked this item on your map. some game icons (most notably the blue npc dots) disappear when you move out of range, so i recommend using an icon to mark the location of important npcs like the dragon trainers (you will see why soon, as mourningwood will have to remark his maps as well!!) so that you can find them if you are trying to find a way back to them - i use the flag icon, myself. you can always hover your cursor over an icon to see what you named it. 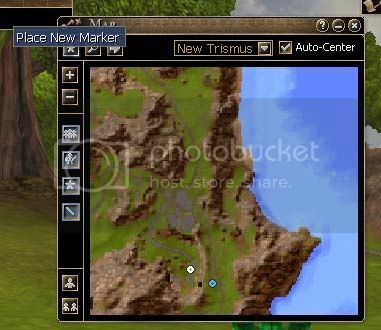 well, now that you know how to mark your map - a very useful function, you will find - you can use it when next time, we explore the town of new trismus! see you soon!